Are you ready to leave behind your one-night-stands and start a meaningful relationship? Well than thank God, Facebook is here to help you! When Mark Zuckerberg, a co-founder and the current CEO of Facebook, said during the annual F8 Conference back in May that ‘one in three marriages in the United States starts online’ (00:19:40-00:19:50), the romantic tone of his subsequent talk was set. 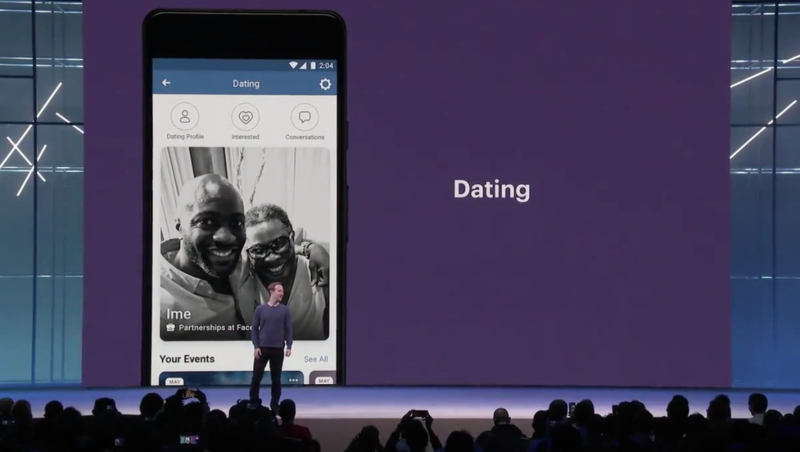 He announced Facebook’s plans to launch a new set of features around dating (00:19:59-00:20:10). But do not expect another online dating platform for finding a hook-up. Zuckerberg enhanced that this feature will make out of Facebook ‘a place where you can start meaningful relationships’ (00:21:38-00:21:50). As good as it sounds, what does it really mean for 2.23 billion monthly active users of the platform ? Launched for the first time for a test in Colombia on the 20thSeptember (Constine, TechCrunch), we have been given some details. Since it will be an opt-in feature rather than an app, you will find it on your ‘More Menu’, right next to another Facebook features such as Marketplace. 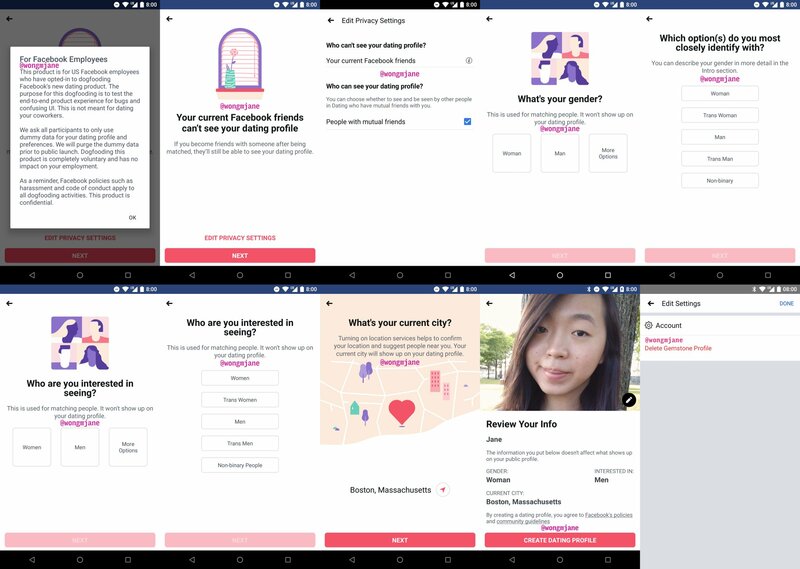 In ‘Dating Home’ you can set up your profile by providing your (only) first name, uploading your best headshot, and adding some essential information such as your gender, who you are interested in meeting and your current location so Facebook can easily determine the nearby places for finding your future happiness. As both Zuckerberg and Cox underlined during the F8 Conference, once you activate the Dating feature, your search for love will not be displayed on your ‘News Feed’. Only you and other people who have activated the feature will be able to see it. After completing your profile, you can start browsing through Events and explore the Groups suggested based on your interests. Cox explained that Facebook wants to mirror ‘the way in which people actually date which is usually at events and institutions that they are connected through’ (00:49:58-00:50:05). This is a major difference compare to dating applications such as Tinder, which focuses mainly on looks. By finding and unlocking the event you are interested in, you will see who else is going. Once someone attracts your attention, you can message them in a private messaging box and start a conversation. Voilà, your love is probably already knocking on your door. 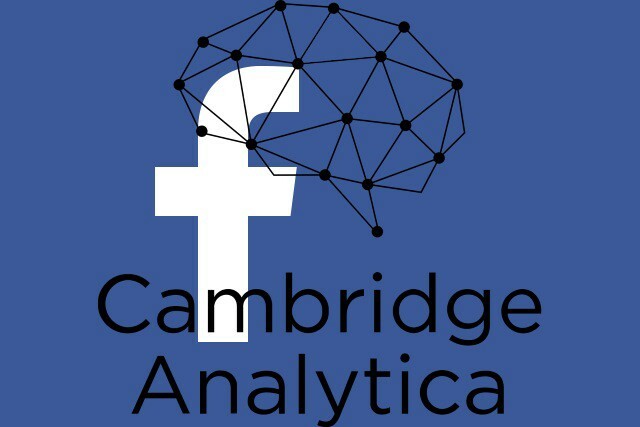 Not the Cambridge University, but the notorious Cambridge Analytica Scandal, which leaked private information of more than ‘50 million Facebook users’ (Cadwalladr, and Graham-Harrison, The Guardian). With the scandal being revealed two months before the F8 Conference took place, Zuckerberg’s lawyers were well aware that the announcement of the Dating feature can cause a whole new bunch of unwanted questions on privacy. Cobb and Kohno explain that the dating profiles in general ‘contain more sensitive information than profiles on other social media,’ and that they are ‘simultaneously more public’ (1231) as they are addressed not only to your friends but often to complete strangers. When it comes to Facebook, the platform has been working as ‘a digital record of life for young people’ (Lincoln and Robards, 518), collecting more personal data than we can imagine. And now this platform will ask you for additional information. Up until now the users did not necessarily have to provide their current location. But in order to find your love, you will need to specify where you are, transforming Facebook even more into ‘a location-based social media platform’ (Wilken, 1087) and feeding it with vulnerable private details. What is presented as a new possibility of starting ‘meaningful relationships’ can thus quickly turn into Facebook’s another tool for gathering missing information on its users as the Dating feature, just like any other dating apps, will require ‘continuous location data’ (Farnden et al., 1) in order to work. Knowing all of this, Zuckerberg, smiling more than ever, assured the audience that the new feature has been designed with ‘privacy and safety in mind from the beginning’ (00:21:01-00:21:15). But how valid is this assurance after what happened with the Cambridge Analytica Data leak? Despite the Cambridge Analytica Scandal, with its subsidiaries Messenger, WhatsApp and Instagram, Facebook controls ‘77 percent of mobile social traffic’ (Taplin, NY Times), dominates its relevant market and leaves only limited space for a relatively small competitive fringe (Haucap and Heimeshoff, 50). However, this position can be sustained only by actively eliminating all of its competition. Zuckerberg has adopted a strategy of copying and then crushing his rivals, just like he did with Twitter in 2012 (Thomson and Vogelstein, Wired) and later on with Snapchat, which firstly he had tried and failed to buy (Bercovici, Forbes). And now it seems that his newest target is Tinder, a dating app popular mainly among young people, who ‘spend 10 hours a week’ swiping through the photos of potential matches (Peat, Independent). All of this taken into account, Facebook is not only offering its users the love of their lives while invading their privacy at the same time. The platform is also trying to crush yet another competitor. Tinder proudly presents itself as the matchmaking king of dating apps, reaching 1.6b swipes per day and standing behind 1m dates per week . With Facebook no longer being the most popular online platform among young users as it was recently revealed by Pew Research Centre(Anderson, Jiang), it is no surprise that Zuckerberg wants to return the company back to the spotlight by targeting Tinder. Although this time it does not look as obvious as it did when he shamelessly copied Snapchat’s concept of stories, certain resemblance is there. Or is it just me seeing it? 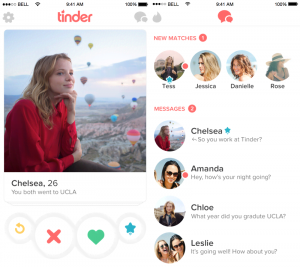 Either way, one thing is sure – the rules of the online dating world will be altered and potentially dictated by the platform that was originally launched as a social-networking service for Harvard students but has grown into a monopoly-like titan. In order to find your true love through Facebook, you will have to sacrifice another proportion of your privacy to the platform that is still recovering from the scandalous data leakage. The same platform that eliminates its competition by copying and crushing the rivals, now aiming at Tinder with its Dating feature. Maybe it is about time to go back to good old-school dating style – finding your partner in the real rather than online world. Figures 1 and 3– Facebook. F8 2018 Day 1 Keynote. The screenshots were taken 5 September 2018. Figure 2– Twitter. @wongmjane. Accessed 14 September 2018. Figure 4– A Medium Corporation. Accessed 19 September 2018. Figure 5 – MTV News. Accessed 19 September 2018. Figure 6– Wired. Accessed 21 September 2018. Anderson, Monica, and Jingjing Jiang. “Teens, Social Media and Technology.” Pew Research Centre. 31 May 2018. http://www.pewinternet.org/2018/05/31/teens-social-media-technology-2018/. Accessed 15 September 2018. Bercovici, Jeff. “Facebook Tried to Buy Snapchat for $3B in Cash. Here’s Why.” 13 November 2013. https://www.forbes.com/sites/jeffbercovici/2013/11/13/facebook-wouldve-bought-snapchat-for-3-billion-in-cash-heres-why/#19ef882943de. Accessed 6 September 2018. Cadwalladr, Carole, and Emma Graham-Harrison. “Revealed: 50 Million Facebook Profiles Harvested for Cambridge Analytica in Major Data Breach.” The Guardian. 17 March 2018. https://www.theguardian.com/news/2018/mar/17/cambridge-analytica-facebook-influence-us-election. Accessed 6 September 2018. Cobb, Camille, and Tadayoshi Kohno. “How Public Is My Private Life? Privacy in Online Dating.” WWW 7 (April 2017): 1231-1240. Constine, John. “Inside Facebook Dating, Launching Today First in Colombia.” TechCrunch. 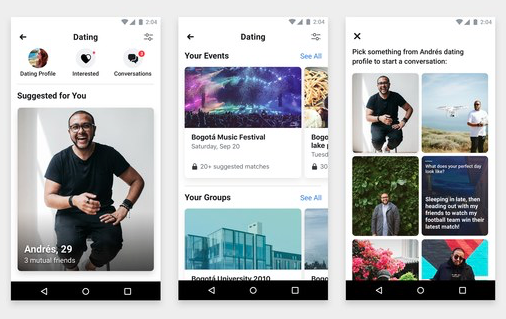 20 September 2018. https://techcrunch.com/2018/09/20/how-facebook-dating-works/. Accessed 21 September 2018. Cox, Chris. 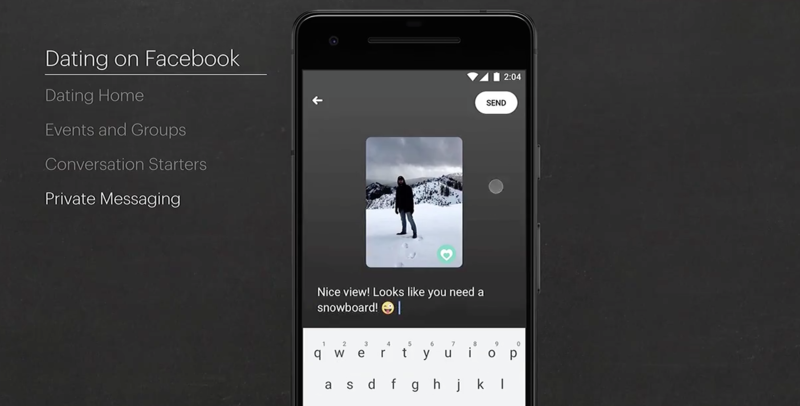 Video “F8 2018 Day 1 Keynote.” Facebook. 1 May 2018. https://developers.facebook.com/videos/f8-2018/f8-2018-day-1-keynote/. Accessed 5 September 2018. Farnden, Jody, and Ben Martini, and Kim-Kwang Raymond Choo. “Privacy Risks in Mobile Dating Apps.” AMCIS (August 2015): 1-16. Haucap, Justus, and Ulrich Heimeshoff. “Google, Facebook, Amazon, eBay: Is the Internet Driving Competition or Market Monopolization?” Springer11 (2014): 49-61. Peat, Jack. “Millennials Spend 10 hours a Week on Dating Apps.” Independent. 23 January 2018. https://www.independent.co.uk/life-style/dating-apps-millenials-10-hours-per-week-tinder-bumble-romance-love-a8174006.html. Accessed 10 September 2018. Taplin, Jonathan. “Is It Time to Break Up Google?” New York Times. 22 April 2017. https://www.nytimes.com/2017/04/22/opinion/sunday/is-it-time-to-break-up-google.html. Accessed 16 September 2018. Thomson, Nicholas, and Fred Vogelstein. “Inside the Two Years That Shook Facebook – And the World.” Wired. 12 February 2018. https://www.wired.com/story/inside-facebook-mark-zuckerberg-2-years-of-hell/. Accessed 6 September 2018. Wilken, Rowan. “Places Nearby: Facebook as a Location-based Social Media Platform.” New Media and Society7 (2014): 1087–1103. Zuckerberg, Mark. Video “F8 2018 Day 1 Keynote.” Facebook. 1 May 2018. https://developers.facebook.com/videos/f8-2018/f8-2018-day-1-keynote/. Accessed 5 September 2018.